Enjoy the fun and freedom of the open seas with the Carnival Liberty, the cruise ship that offers something for everyone. Step on board the Carnival Liberty to discover a world of fun. Each day is an opportunity to try something exciting and new, whether that is watching the sunrise spectacularly from the jogging track, sliding down the Twister Waterslide or catching a flick at the dive-in movies. Foodies have a full line of dining options to feed their curiosity with restaurants like Guy’s Burger Joint, Blue Iguana Cantina and plenty more. Bring your children to the Kids Club or the Teen Club where exciting new adventures, activities and new friendships await them. The legendary Las Vegas-style evening shows will bright up your nights, while you can elevate your mood with live music and hilarious standup comedy shows at one of the many on board bars. Dance the night away with the beats of DJ Irie, the official DJ of the Miami Heat. For a quieter evening, sit back and relax at one of the many lounges on board. Step on board the Carnival Liberty to discover a world of fun. Each day is an opportunity to try something exciting and new, whether that is watching the sunrise spectacularly from the jogging track, sliding down the Twister Waterslide or catching a flick at the dive-in movies. Foodies have a full line of dining options to feed their curiosity with restaurants like Guy’s Burger Joint, Blue Iguana Cantina and plenty more. Bring your children to the Kids Club or the Teen Club where exciting new adventures, activities and new friendships await them. The legendary Las Vegas-style evening shows will bright up your nights, while you can elevate your mood with live music and hilarious standup comedy shows at one of the many onboard bars. Dance the night away to the beats of DJ Irie, the official DJ of the Miami Heat. For a quieter evening, sit back and relax at one of the many lounges on board. 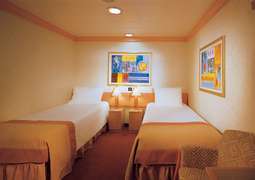 Carnival Liberty has a great range of staterooms on offer to suit every cruiser’s budget and leisure needs. 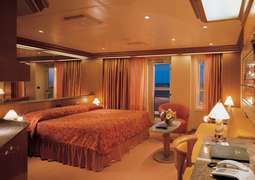 Interior staterooms provide exceptional comfort, while Oceanview and Balcony staterooms offer fantastic ocean views. For those after a touch of luxury, Carnival Liberty’s range of Suites provides the ultimate in cruising indulgence. Carnival Liberty offers an exceptional variety of complimentary and specialty restaurants to pamper your palate. Big, juicy burgers await you at Guy’s Burger Joint, with the fresh fare on offer at the Mexican Blue Iguana Cantina and authentic Italian served 24 hours at Pizza Pirate. There’s always something to do onboard Carnival Liberty. There are several pools to lounge around daytime, with a variety of clubs, bars, spectacular stage shows, live bands and comedy nights providing a colorful evening program for the whole family to enjoy. Enjoy a dive-in movie at the Carnival Seaside Theatre, test your trivia at the Hasbro Game Show or take the kids to the onboard Build-A-Bear Workshop. A world of rejuvenation awaits you on board the Carnival Liberty. Stay active with on board with a fully equipped fitness center and jogging track, or relax and unwind with an indulgent range of wellness facilities, such as the Spa Carnival, onboard Hair & Beauty Salon and Serenity Adult Only Retreat. The Carnival Liberty was launched in July 2005. It was built in the Italian shipyard in Monfalcone. The Vista from Carnival Cruises cruising company operates under the Panamanian flag. At a length of 952 feet it can accommodate a maximum 2,974 passengers. 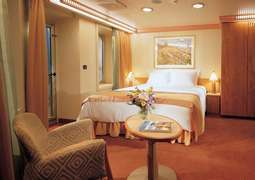 The ship has been highly praised for the luxury of their accommodation. Her greater speed — and the fact that eighty percent of her cabins are outward-facing, and of those, the majority have balconies — make Carnival Liberty the perfect ship for special or longer vacations in the Bahamas. On the Carnival Liberty itself offers an incredible selection of activities. Here you can really relax and it will never get boring. The Spa in the Liberty allows you to both get fit with fitness classes and relax completely and be pampered. While children can go to the children’s program “Camp Ocean”, you can fully concentrate on yourself. Relax at one of the pools or try Serenity Adult Only Retreat. Celebrate your vacation in one of the bars or lounges. For entertainment at night, grab a seat in the main stage area for a crowd-thrilling performance. The Carnival Liberty is home to five different restaurants in which you can enjoy cuisine at its finest. Each restaurant will endeavor to make sure you enjoy all the culinary delights on their menus. Elegant dining with breath-taking sea views is a grand experience, from the hand-picked décor to the attentive table service that will take you to a whole new level. Allow master chefs to satisfy the most stubborn taste buds and prepare to be delighted. On a Carnival Liberty, your stateroom is your home base. The cabins on the Liberty are known for their tremendous comfort and beautiful design. 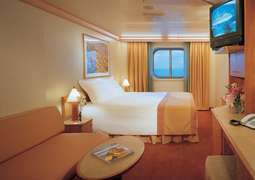 This cruise ship does not hold back on providing the passengers with the ultimate leisurely and comfortable experience.